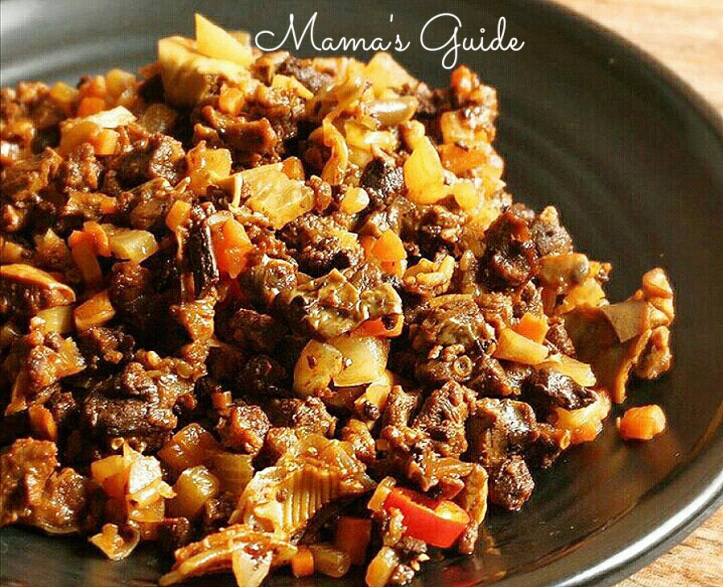 Super spicy Bopis Tagalog recipe, made from Pork lungs, heart and liver. The number one appetizer of Filipinos who loves to drink beer and also a favorite Lutong Bahay menu of most Filipino household. Just a gentle reminder though that this is not ideal to eat for people who suffers from rheumatism because of its high uric acid content. Add pork fat, heart and lungs, pour 1 cup of vinegar, 1 tbsp salt and enough water to cover the meat in a large pot. Cook and let it boil for 20 minutes. Drain meat from water and chop the meat finely. Set aside. Heat annato oil in a pan and saute garlic and onions. Toss the meat and stir fry for 3 minutes. Season with cayenne pepper and add some bay leaves. Pour annatto powder mixture then add fish sauce to taste and sprinkle with freshly ground black pepper. Mix well to incorporate the seasoning. Turn off heat.